Baby Rhino Skylar at Baby Rhino Rescue | Adopt and Donate Now! Skylar arrived at Care for Wild Africa in August 2014. Her mother was poached, though the poachers were interrupted and never managed to cut off her mother’s horn. Skylar was found in the Crocodile River bordering on Marloth Park. 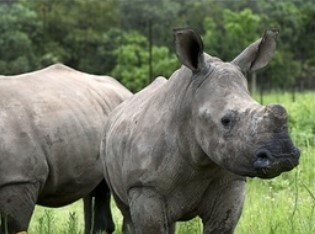 Skylar arrived at the same time as Thor, the little black rhino. They were in the same crate, both had been sedated. The sedation drugs had an adverse impact on Skylar and she stopped breathing. Skylar "died" the night she arrived. The team had to take off her blindfold and drag her out of the crate. Petronel was determined to revive her. One person blew into her nose and another jumped on her chest as more of the reversal drug was administered into her veins. After a couple of minutes it seemed that all was lost. One of the volunteers said, “She is gone.” Petronel shouted, "They are never gone." She instructed everyone to keep going, and they brought Skylar back to life! At first Skylar was extremely anxious and could not relax. She would close her gums when the volunteers tried to bottle feed her so that they could not get the teat into her mouth. It was only when Skyler met her new rhino family that she began to relax and trust her environment. She has a beautiful night pen, complete with soft hay to sleep on and during the day she goes out into the wide outdoors to graze on succulent grass and lie in the shade of the acacia trees. She is the little sister of the three rhinos she shares an enclosure with: Tank, Satara and Robyn. Because she had such a rough start, she can act like a "toughy." Robyn has adopted Skylar: she is the bigger sister and is always by Skylar’s side, looking over her. This has contributed to Skylar’s happiness. It took time, but Skylar has settled down beautifully now and is a well-adjusted and very happy young rhino.